Hello, Guys! I am an Insurance Salesman. My name is K M Chisty Shiam. It is a very proud moment for me because I am writing about my success in Insurance field. 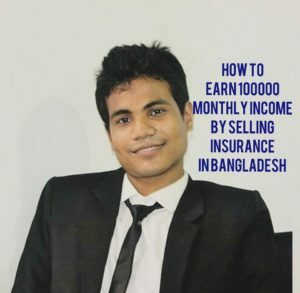 I am working for a very renowned insurance company in Bangladesh. I recently working in Chittagong, the second-largest city after Dhaka. The main purpose of my writing is to inspire you. If I can I will be happy. I completed my HSC in 2012 and studying at University. I was very frustrated while I just entered in University life. It was a very hard moment for me to maintain my educational expenses as I am studying in private University. I was looking for something to earn money. One day, I attended a seminar that was about Insurance selling process. It was very difficult time for me while I was a very little boy in this industry. I just knew that there is much negative news about Insurance companies in Bangladesh. The people of Bangladesh loves Bank rather than Insurance. I don’t know why. So, what I learned from the seminar? I learned that Insurance is something that can help you and your family while you are a financial disable. As an Insurance salesman also learned, investing in Insurance is far better than Bank, because Bank will give you only profit after the maturity period but insurance will give you financial protection. Not only financial protection but also maturity value, life risk coverage, medical fees, critical illness benefits and so on. So, I liked their lecture and joined the company while I am only 19 years old. The requirements for joining was HSC passed certificate, NID Copy or birth certificate, bank account and passport sized photo. The most interesting fact that, I never spent a little amount of money to get the job. After the joining, I planned for sales. My first client was my father. I sold a DPS to my father for 2000 Taka monthly deposit and the most interesting fact that I am earning the commission from that sale still today. I planned for my sales and my first target was my relatives. In the first year, I sold 28 Life Insurance and my first years earning was 3,36,892 BDT. In the second year, I sold 41 Life Insurance and that year my earning was 4,25,352 BDT and my previous years commission was 3,36,892 BDT. So in the second year I earned 3,36,892+4,25,352 (first year earing+second year earning)= 7,62,244 BDT. J At the end of 2016 I earned 97,789 BDT in average. I just followed three simple rules. I proud I am an insurance salesman. Some of my friends were laughing at me. But I don’t care. I visited 5 New people daily and tried to close 1 insurance policy within 7 days. I trust my clients. They are awesome. Who can work: Anyone, who is 18+ years old. How you will earn: Earning is completely depend on your sales. There are no earning limitations. My minimum monthly income was 9100 BDT and the maximum was 1,83,456 BDT. Payment option: By check or EFT. Two times in a month. Part time: Yes, I am doing it. Area: Anywhere in Bangladesh, even in your village. If you are interested to work then send me your CV on mail.